The whole point of Azure AD B2C is to both have a means of providing authentication between a front end client and a back end resource, and to obtain an access token which can be used for authorization purposes. In this article I'm going to cover some foundational steps before implementing any authentication. Namely I want to talk about how to invoke any web call with Xamarin. After that I'll get into how to setup the basics of the demo app for the solution. But first, an overview of what the demo app is comprised of. For the case of this blog series, I'm going to build up a Xamarin.Forms app that both displays and records restaurant reviews. The backend will be a .NET core Web API which will be responsible for persisting and returning data to the Xamarin.Forms app. We also want to be sure each and every user signs up for our app, and then is logged in, in order to see the reviews. But What's This Post About? Before I get into actually implementing the sign-up and sign-in authentication with Azure AD B2C, I want to take a step back and talk about how to both setup a basic .NET Core Web API and invoke/consume it from a Xamarin.Forms app. Something that I get asked about a lot when I speak at conferences is, how can Xamarin - in the core project - consume web services? So I really want to devote an entire post to talking about that before moving on to the actual authentication. I'm going to break this post down into 2 parts - a tl;dr; where you can find out exactly how to call web services, and then a longer part where I'll go through how I set the solution that I'll be using throughout the rest of the series on Azure AD B2C. First off, all of the code for this post can be found in GitHub here, so go ahead clone it and have some fun! Xamarin unleashes the power of the .NET framework for use in both Android and iOS (and Mac, UWP, Tizen, etc.) - so that means we can use the .NET System.Net.Http.HttpClient class to invoke and consume web services. We can use HttpClient from within the platform projects, but of course it makes more sense to use it from within a core project that's shared across the platforms. 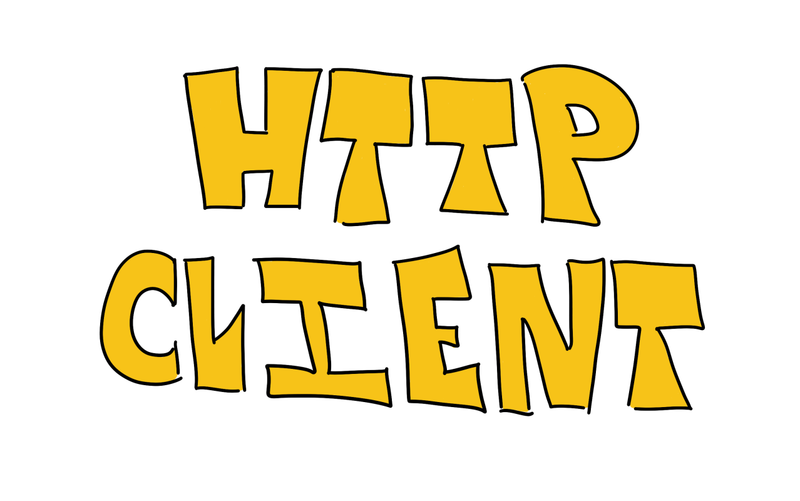 If you're not already familiar with HttpClient it provides 2 mechanisms to perform web calls. The first is, what I'll call the "quick mathod". So in this example - we're able to query http://localhost:5000/api/reviews via a GET and then handle a string it returns (which could be any string - but we'll assume JSON in this case). Then we could use Newtonsoft.Json to handle it. (The HttpClient also has other functions such as GetStreamAsync, DeleteAsync, PostAsync, PutAsync). However, if we wanted to be more explicit as to what we're up to (and that's probably not a bad thing) - like when setting the headers in the request - then we would have to use 2 other objects - HttpRequestMessage and HttpResponseMessage. Here the HttpRequestMessage allows us to explicitly set the HTTP verb to use. The HttpResponseMessage has a function that makes sure a successful HTTP status code is returned, otherwise it raises an exception. Using System.Net.Http is the way to go when communicating to the web with Xamarin. Now... 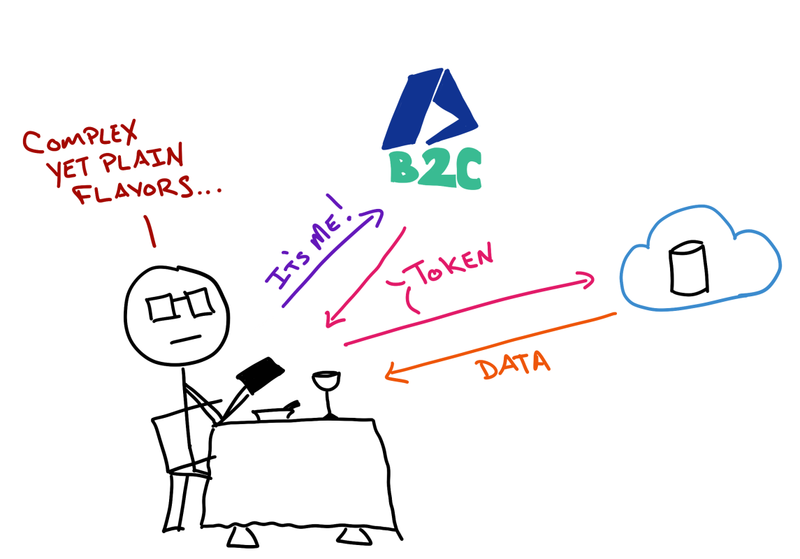 I want to give a rundown of how the projects are setup for the rest of the Azure AD B2C blog series. One thing to note - at least in this sample - I don't have much exception handling or anything along those lines setup. My main goal is to demonstrate how to invoke a web call and get the foundation of the projects setup... fair warning :). I used VS Code on a Mac to create the Web API - which means I am also using the .NET CLI to create the projects. dotnet new webapi -n "NAME OF YOUR WEB API PROJECT"
The first command will create the Web API project will all of the necessary files. The second command will restore all the NuGet packages. And after issuing the dotnet run command a web server will start up and you will be able to browse to http://localhost:5000/api/values and should see some JSON returned. The next step is to create a controller that will return the reviews of various restaurants to the Xamarin.Forms app. First thing first - we need to create a class that will model the review. So create a folder called Models and then a class called Review.cs. Name the class Review, pop it into an appropriate namespace, and put in a single property - name it Text. The key here is to make sure the class inherits from Controller and then the Route attribute - which tells the runtime the URL which this controller gets invoked. That's it ... issue dotnet run in the terminal again, and then browse to http://localhost:5000/api/reviews and you should see a JSON array come back with 2 records - one that says "Yum" and one that says "Meh". Easy part, create a Xamarin.Forms solution. Semi, easy part - convert it to a .netstandard core project. As of right now - the way I go about doing that is adding a .NET Standard library to the project, then add all of the files into that library - add the references from the platform projects ... make sure everything compiles - you get the picture. After that, create a new folder Models, then add a Review.cs file that is going to look exactly like the model class you created above for the ASP.NET Web API. (Now, we could go into code sharing between the 2 solutions, but for now, we'll keep them separate). public Command RefreshCommand => _refreshCommand ?? Of course - there'a property in there as well, AllReviews. Finally, we'll need to hook up the view model to the view and do the bindings. The long story here is the ListView.ItemSource should be bound to the view model's AllReviews property and TextCell including within should be bound to the Text property of the Review class which composes the AllReviews list. Within the constructor, call the RefreschCommand.Execute function, so it loads data immediately - and that's all there is to it. We went through a lot here, and most of it was related to project setup. But the big, big point of all this is that you can invoke web services fairly easily by using System.Net.Http.HttpClient. And there are 2 ways you can get data ... and quick and easy way by using functions directly off of HttpClient and a way that provides more functionality by using HttpRequest and HttpResponse in combinatino with HttpClient. 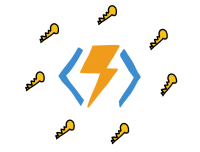 In the next post, I'll take a look at getting the Xamarin.Forms app to use Azure AD B2C to authenticate with Azure, and then use that authentication token to retrieve data from a "locked down" ASP.NET Web API.